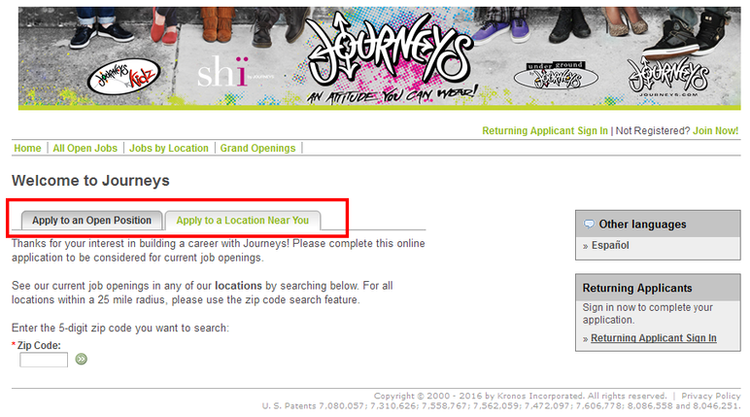 Entering the official site of Journeys, click APPLY NOW to know about current openings. 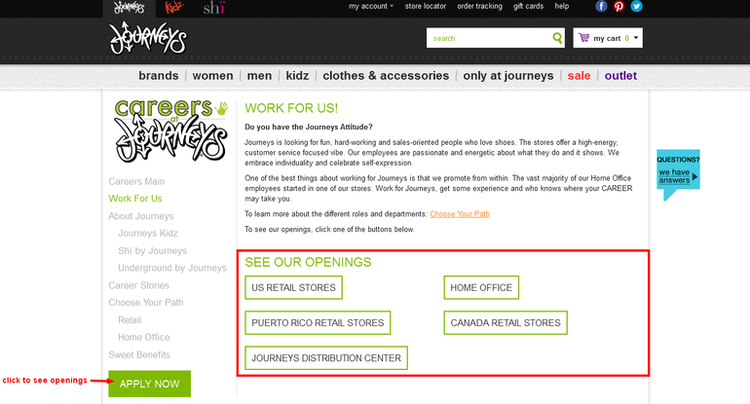 You can take a short cut to retail and home office openings directly by click on the two links on the left. Sweet benefits gives a general picture of treatment in Journeys. Currently, there are five categories of opening type. Choose one type in the next page to continue. 1.Search through open positions, which lock the position first then to pick a location where provides this opening. 2.Search through zip code, which lock the location and store first then to pick positions among these stores. We take the first one as an example. Choose an opening to move on. After confirming the content of job description and ensure that you are qualified for the position, click Choose a Location to continue then. On the next page you need to type your zip code, pay attention to the distance in an ascending order. Choose one from them to meet your preference. 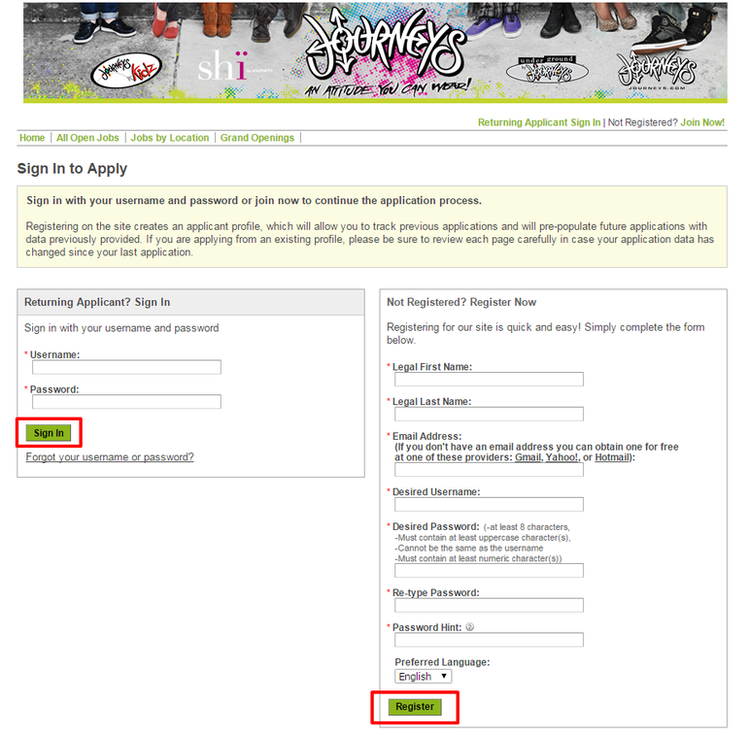 Usually you need to register and sign in when you first time apply for a job on the official site. Notice that the email you use for registration must be Gmail, yahoo mail or hotmail. Sign in or register to continue. 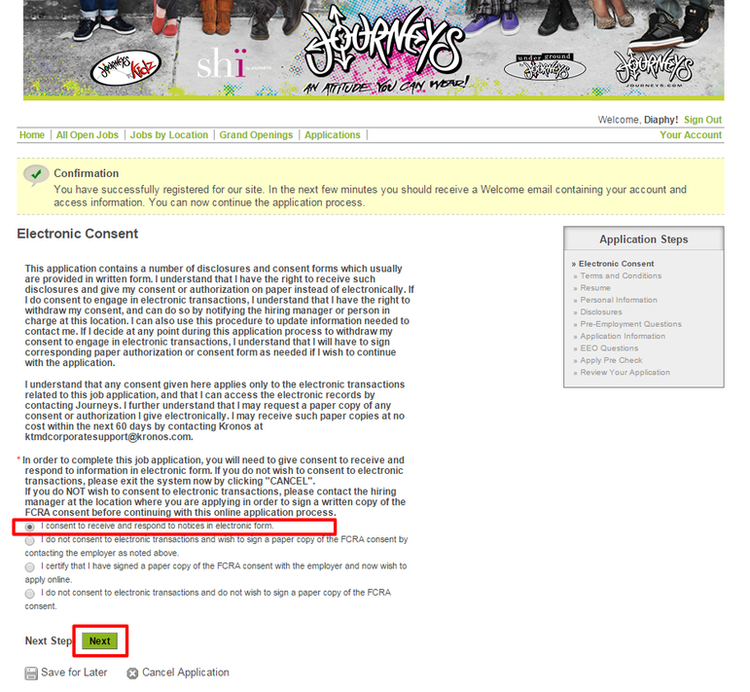 It is suggested to select ”I consent to receive and respond to notices in electronic form” for the electronic consent, and agree terms to enter the next page. 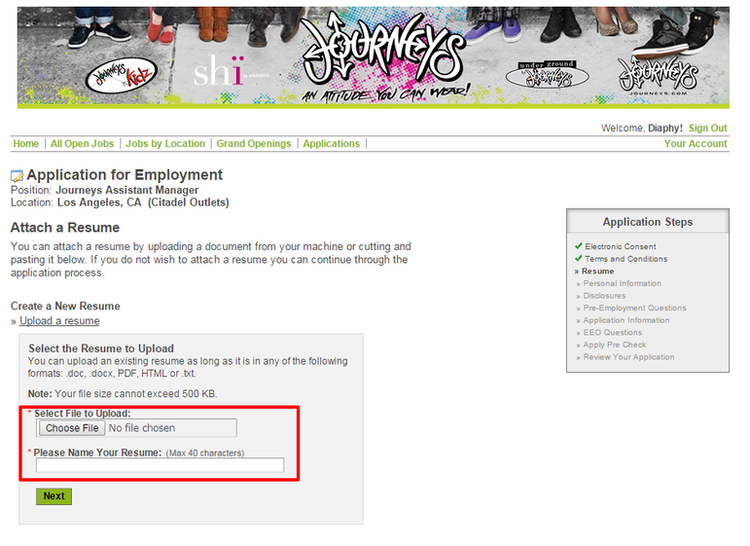 Attach your resume through the three ways given on Journeys site. We recommend “Upload a resume”. This is a form all about your personal information which enables your future employer to contact you. Tip: don’t Forget to CONTINUE your uncompleted application. 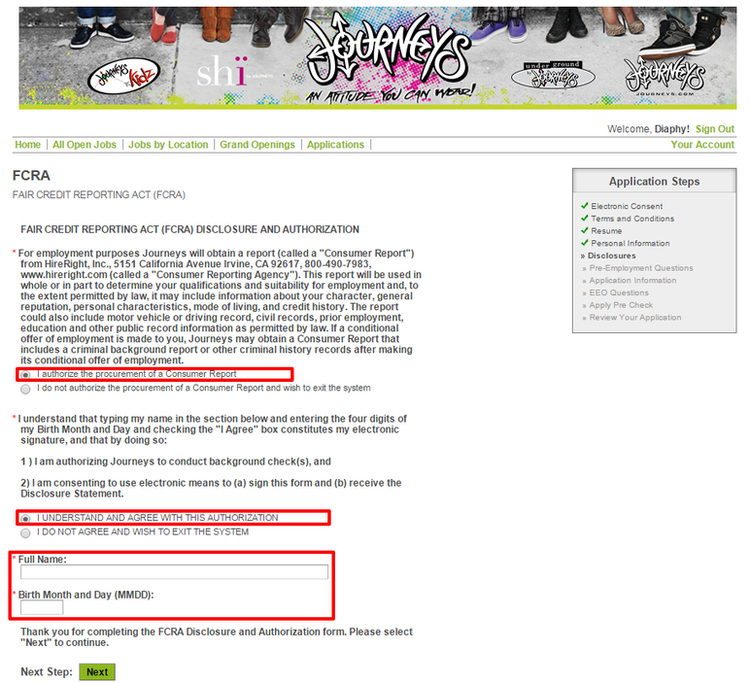 Here you need to repeat from step6 to step7 continue your application on Journeys. Then you will enter the pages of FAIR CREDIT REPORTING ACT (FCRA), disclosures and Pre-employment. Finish these steps to continue. You can check your progress in the process box on the right. 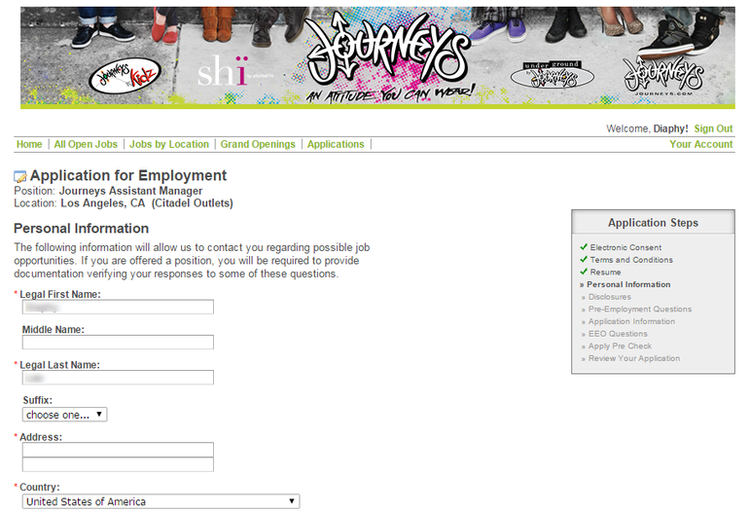 Click journeys.com/careers to apply for Journeys jobs online.